Actively, via protests and armed insurrection. 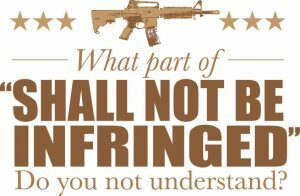 In Connecticut, hundreds of gun owners have not complied with a new state law requiring all gun owners to register their firearms by January 1, 2014. The CT state legislature had passed that law by invoking the Sandy Hook school shooting. In Colorado, elected county sheriffs (55 out of 62) have signed on to a federal lawsuit challenging the constitutionality of a package of gun-control laws requiring background checks for private gun transfers and outlawing magazines over 15 rounds. The state legislature had passed those anti-Second Amendment laws by invoking the alleged Sandy Hook massacre and the preceding Aurora theater shooting. Some sheriffs, like Weld County Sheriff John Cooke, are refusing to enforce the laws, saying that they are too vague and violate Second Amendment rights. Many more say that enforcement will be “a very low priority,” as several sheriffs put it. Even in “liberal” blue state California, gun owners in Sunnyvale, a city in Silicon Valley, are defying a new local law banning high-capacity magazines by refusing to turn in those magazines by the March 6 deadline. San Francisco had approved a similar ban last year, but SF police Sgt. Eric O’Neal said his department has no system to track whether any magazines have been turned in for destruction under the new ordinance. Both Sunnyvale and San Francisco enacted their gun control laws in reaction to the alleged Sandy Hook massacre. Add the gun owners of New York to the above list of passive resisters. Bob Owens reports for Bearing Arms, April 5, 2014, that New York state residents are required to register an estimated 1 million firearms designated as “assault weapons” under the NY SAFE Act by April 15. But it appears there is overwhelming noncompliance. NY State Police refuse to publicly share the number of firearms that have been registered (citing a provision of the NY SAFE Act itself), but leaks purporting to be from within the agency indicate that only 3,000 to 5,000 firearms have been registered, which suggests a noncompliance rate of a whopping 99.5%. NY governor Andrew Cuomo had also invoked the Sandy Hook massacre when he pushed through the Orwellian-named SAFE Act. Do you see a pattern in the red-colored sentences above? So if the Sandy Hook massacre indeed was a false flag, expect another even more heartrending mass-trauma false-flag event to come our way soon. For links to the posts FOTM has published on this contrived event, go to our “Sandy Hook Massacre” page. “3 of 10 registered voters think U.S. needs an armed revolution,” May 2, 2013. “DHS training video depicts gun-owning militia as terrorists,” May 2, 2013. “Why does Dept of Homeland Security need thousands of mine-resistant armored vehicles?,” Mar. 6, 2013. “PA police chief invites citizens to join 2nd Amendment Reserve Force,” Feb. 14, 2013. As many as a million New York residents have failed to register their “assault weapons” and “high capacity” magazines with the state, by the April 15 deadline. Read more at Guns.com.